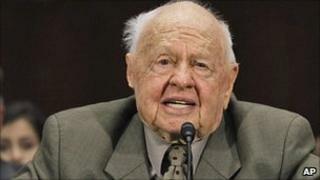 Control of US actor Mickey Rooney's finances will be permanently handed to his lawyer after a court was told money is missing from the star's accounts. Michael Augustine said $400,000 (£250,000) had disappeared, adding Mr Rooney had so little cash that he frequently wears the same clothes and has just one pair of shoes. Mr Rooney has accused his stepson Christopher Aber of blocking information about his finances. Mr Aber denies any wrongdoing. In February, Mr Rooney was granted a temporary restraining order against his stepson accusing him of bullying and intimidation. According to court documents, he allegedly deprived Mr Rooney of medication and food and confiscated his passport and other identification cards. Mr Rooney also accused Mr Aber - the son of Mr Rooney's eighth wife, Jan Chamberlin - of forcing him to make personal appearances and sign financial documents without reading them. In a sworn testimony at Los Angeles County Superior Court, Mr Augustine said Mr Rooney told him he was unable to buy his wife flowers on Valentine's Day because "I have no money." Mr Augustine's conservatorship will remove Mr Aber from involvement in Mr Rooney's business. Mr Aber has also agreed to stay away from the actor and his home without the Los Angeles court extending the restraining order. Mr Rooney's wife described the former child star as "one of the remaining Hollywood legends" and said she hoped he would benefit by the conservatorship's "inherent checks and balances".